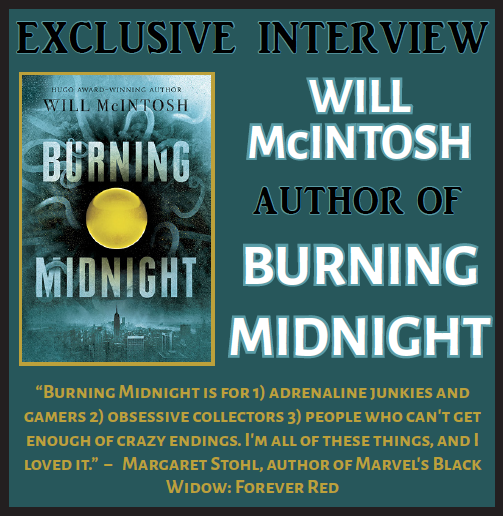 We're honored to have Hugo-Award-winning Will McIntosh here to talk about his first YA novel BURNING MIDNIGHT. Will, what scene was really hard for you to write and why, and is that the one of which you are most proud? Or is there another scene you particularly love? For me, the hardest scenes to write tend to be the quiet ones, the ones where characters are talking, planning, getting to know each other. They’re essential to the story, but you always risk boring readers. One of the hard scenes to write in Burning Midnight involved an argument between the two main characters, Sully and Hunter. Sully accuses Hunter of being closed off and secretive, and Hunter, furious, reveals the secret that drives her to keep to herself. I had to rewrite it a few times to bring out each character’s emotions in what I hope is a realistic and emotionally powerful manner. The scene I love, the one I tend to read when I’m doing a public reading, is where Sully and Hunter find a very, very rare sphere in the middle of winter in a very unlikely place. It made me very happy to give my poverty-stricken characters that moment. 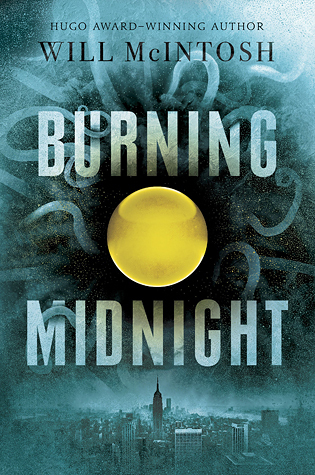 What was your inspiration for writing BURNING MIDNIGHT? When I was twelve, my sister, a cousin, and I stumbled on a 60 year-old dump in the woods. We spent a summer hunting for antique bottles, and built a collection of something like 200 that we displayed on the porch. Those great memories led me to want to create a story about hunting and discovering incredibly valuable things in the wild. How long did you work on BURNING MIDNIGHT? Five months. I write Monday to Friday, 9 a.m. to 5:30 p.m., with a one hour break for lunch and exercise, so I write relatively fast. I resigned a tenured university position when my family moved to Williamsburg, and now writing is my profession, so I take it very seriously. Fortunately, there are few things I love more than writing. I never get tired of it, so having all those hours each day to write makes me very happy. This is my first Young Adult book, but I’ve published four adult SF books, and this was by far the easiest road to publication one of my books has experienced! I delivered it to my agent, he emailed to say he was sending it out to editors, and we should hear back in four to eight weeks. Two days later, he called to say the editor at Delacorte Press had made a two-book preempt offer. I was thrilled, and we made a deal that same day! My next Young Adult novel. It’s about the lies and deception that are such a big part of modern society. I want to title it The Future Will Be Bull**** Free, but I’m guessing that would stifle sales a bit. For now, that’s all I can say. Sully is a sphere dealer at a flea market. It doesn’t pay much—Alex Holliday’s stores have muscled out most of the independent sellers—but it helps him and his mom make the rent. No one knows where the brilliant-colored spheres came from. One day they were just there, hidden all over the earth like huge gemstones. Burn a pair and they make you a little better: an inch taller, skilled at math, better-looking. The rarer the sphere, the greater the improvement—and the more expensive the sphere. There’s no question the Gold is priceless, but what does it actually do? None of them is aware of it yet, but the fate of the world rests on this little golden orb. Because all the world fights over the spheres, but no one knows where they come from, what their powers are, or why they’re here. Have you had a chance to read BURNING MIDNIGHT yet? How do you keep the quiet scenes interesting? Do you incorporate childhood memories into your stories? Share your thoughts about the interview in the comments!